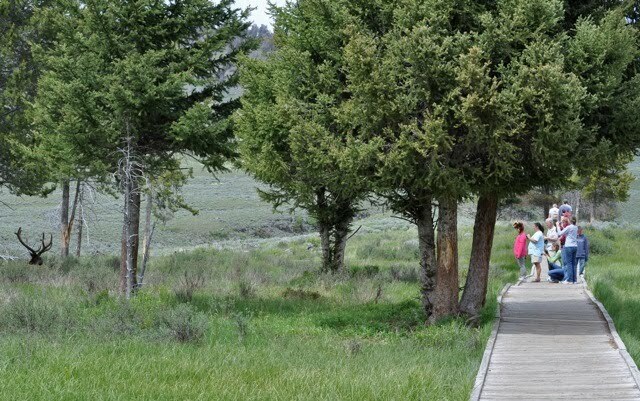 With less than a week left in our stay near Yellowstone, we decided to make one last trip into the park. 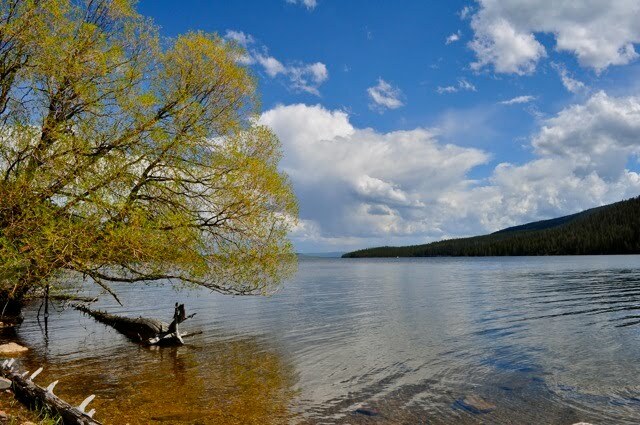 We packed a picnic and headed for Yellowstone Lake. 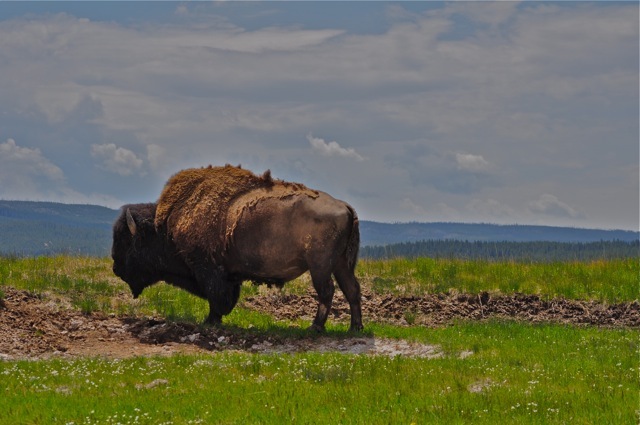 Shortly after entering the park we saw our requisite bison for the day. 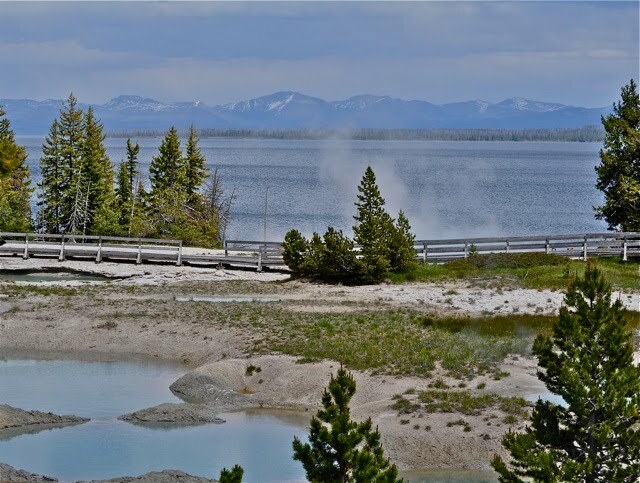 We chose the southern route to the lake, which took us by the lovely Firehole River and many steamy geyser basins. 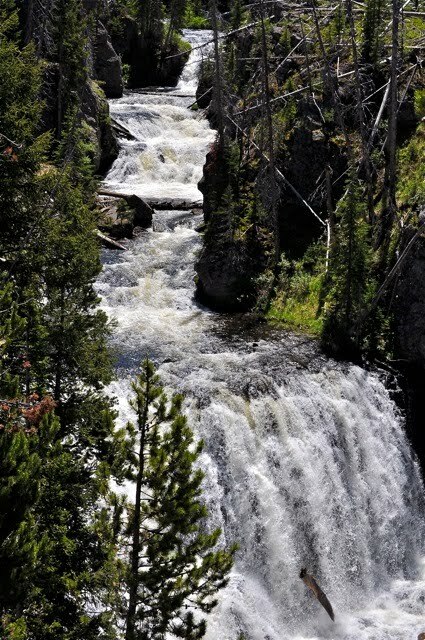 We made a stop along the Firehole to check out Kepler Cascades, a couple of miles south of Old Faithful. 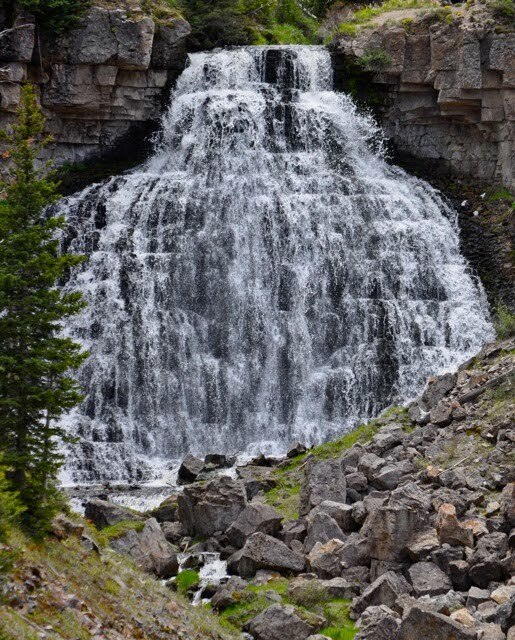 The cascades make multiple drops over 150 feet. They look and sound beautiful! We enjoyed our picnic lunch near the West Thumb Geyser Basin on the shore of Yellowstone Lake. This basin has a little bit of everything. 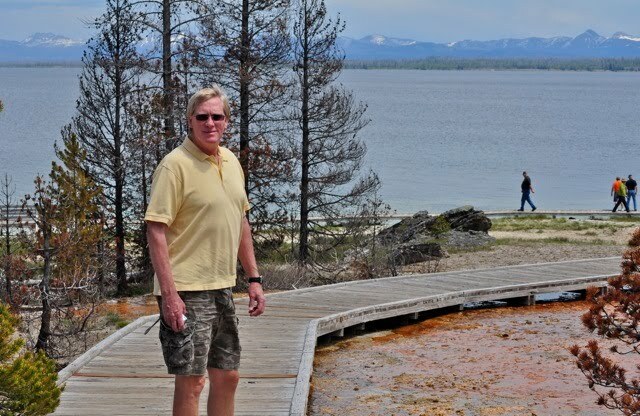 Paul led the way around the boardwalk through the basin and along the lakeshore as we passed mud pots, springs, pools and geysers. 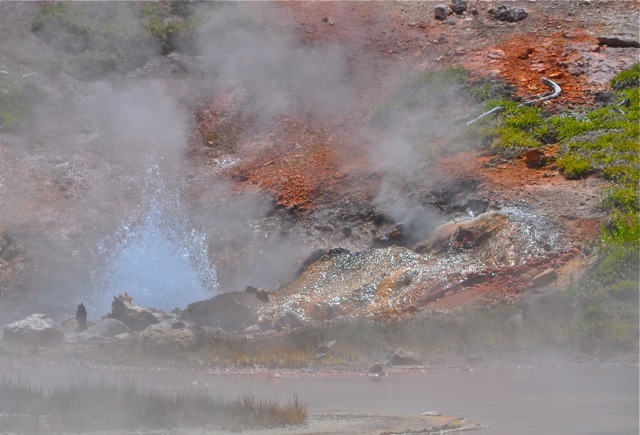 The geysers were dormant during our visit. 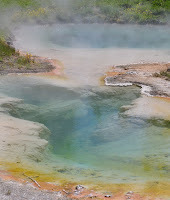 But, the pools and springs were very colorful. 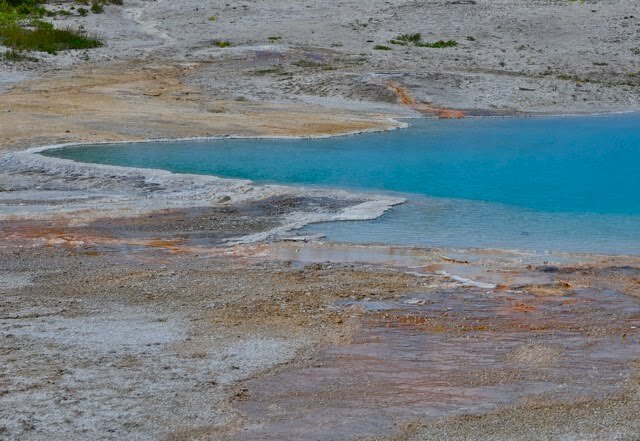 This beautiful blue pool is, in our opinion, misnamed. 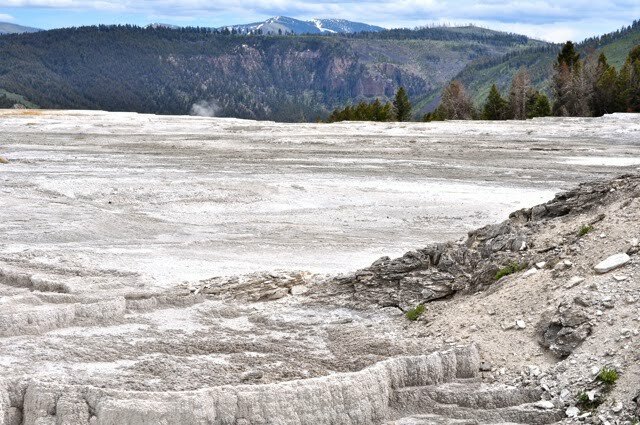 What do the good folks at Yellowstone call this place? Black Pool. Really! Isn't this a beauty? 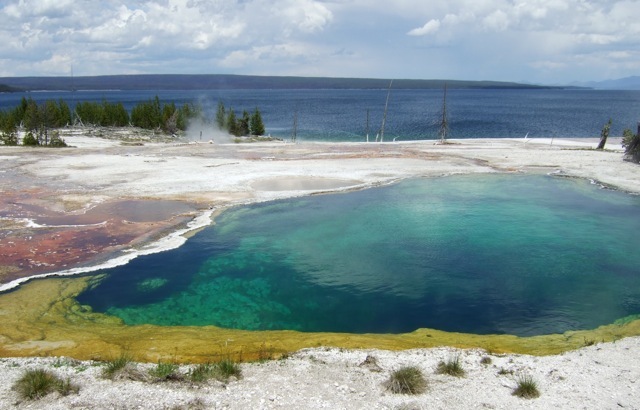 Paul declared Abyss Pool the coolest thing he's seen in Yellowstone. 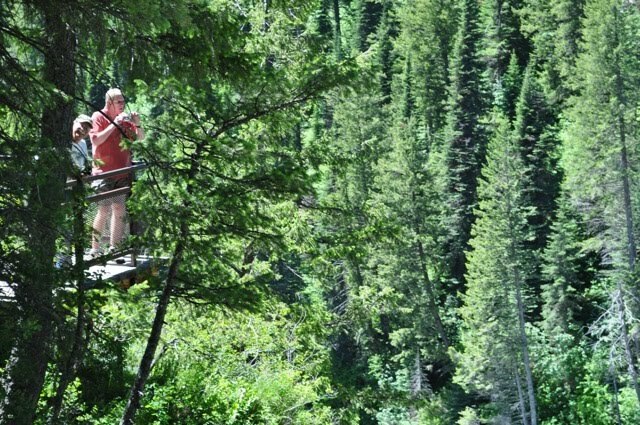 At 53 feet, it's one of the deepest hot springs in the park. All that hot water gives it lots of jewel-toned shimmer. 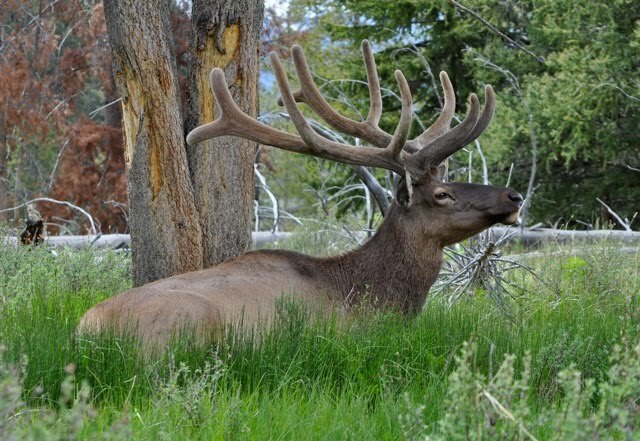 Looks like we definitely saved the best of Yellowstone for last! The highlight of the trip was, of course, the falls. 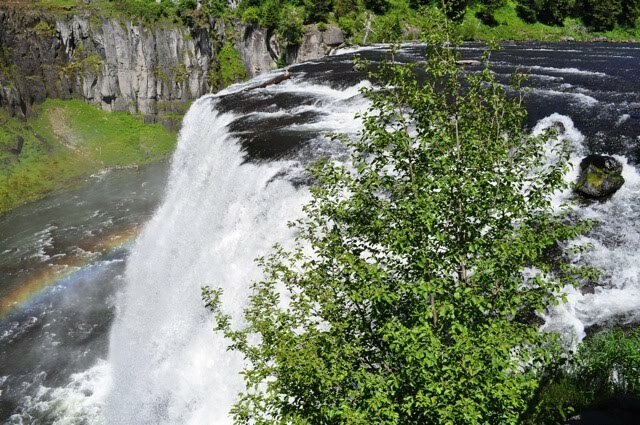 The Upper and Lower Mesa Falls are the only major falls in Idaho not used for irrigation or hydroelectric power, so visitors can view them in their natural, undisturbed beauty. Our short trek into the forest to see the Upper Falls was well worth the trip. And, today's abundant sunshine offered us another treat. 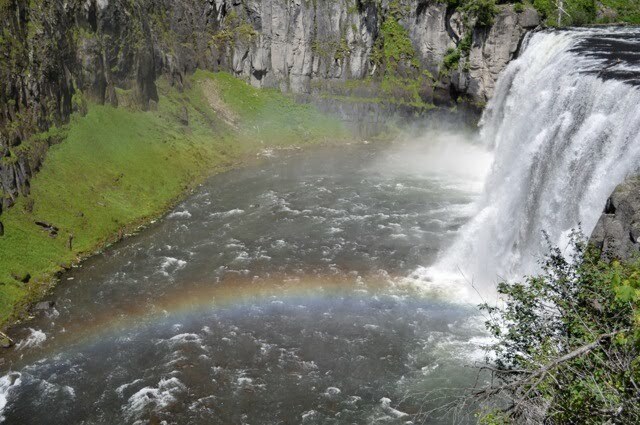 Today was a rainbow day at the falls. Now, that's stunning! Who's that hiding in the forest? Gordon and Paul are enjoying another view of the falls. 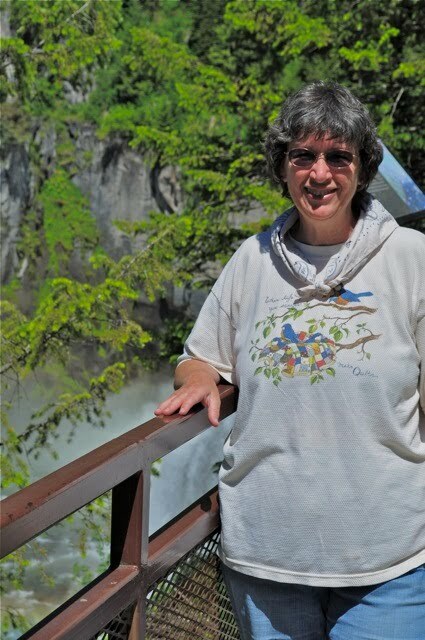 And, there's Juanita enjoying the sunshine and the falls. 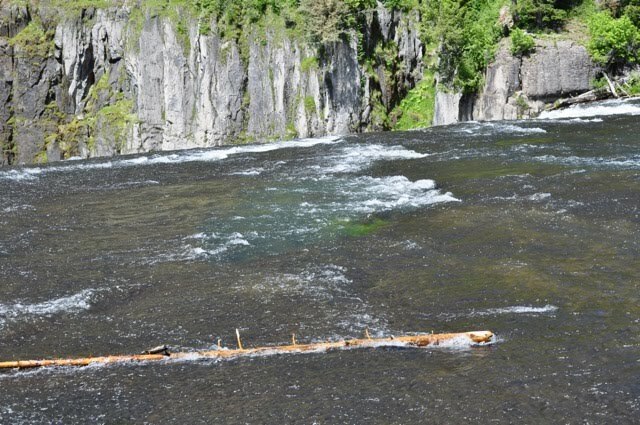 The Visitor Center at Mesa Falls is a beautifully restored log building that has been home to, among other things, a stage stop, an inn and a Boy Scout camp. 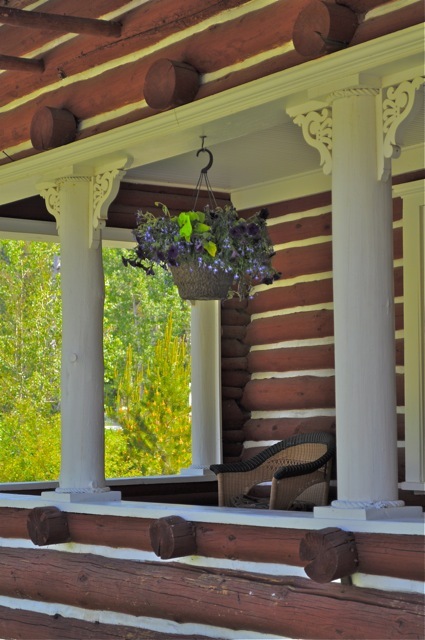 With the sound of the falls in the background, the front porch is a great spot to sit and relax. 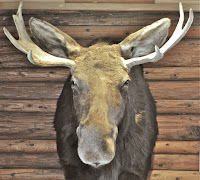 We've yet to see a moose (besides our own) on this trip. 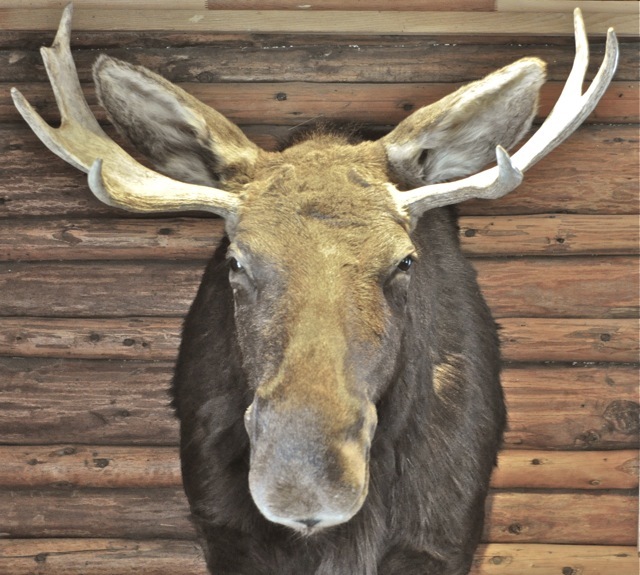 This mount is on display inside the visitor center. With our visit to falls complete, we made our way to the southern end of the byway and on to Walmart. 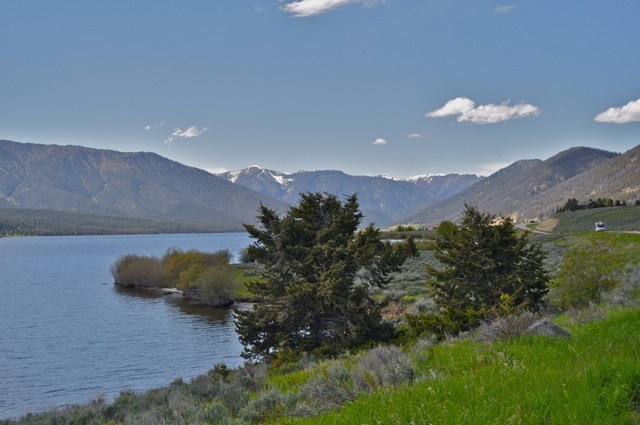 If you find yourself traveling along US-20 south of Island Park on your way north to Yellowstone, or south to Rexburg, we recommend you take this lovely little diversion. You'll be glad you did! 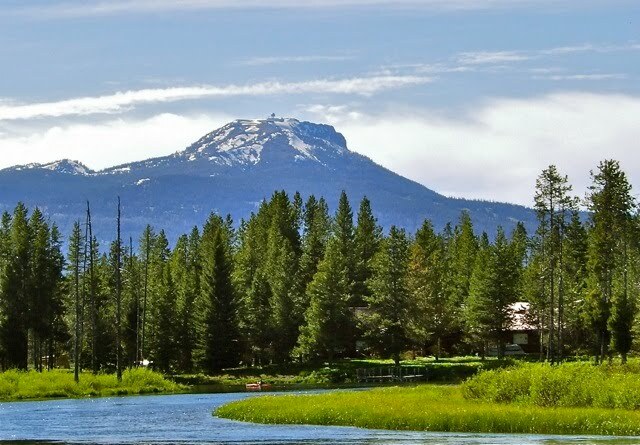 Spend any time at all around Island Park and you'll notice Sawtelle Peak. 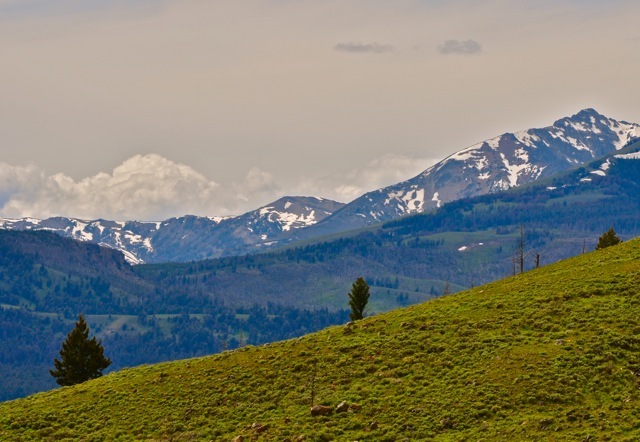 Standing at nearly 10,000 feet, this commanding mound forms the eastern end of the Centennial Mountains. 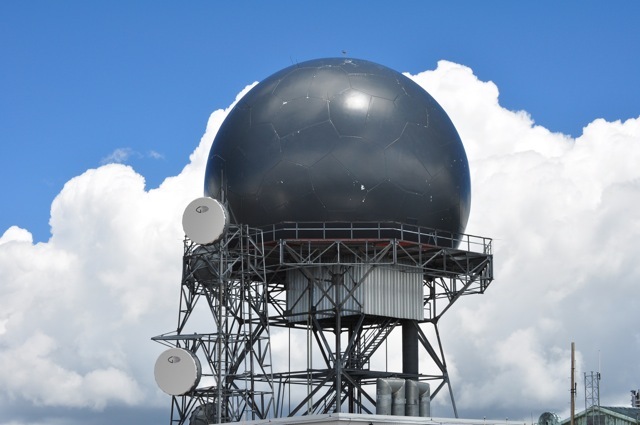 If its height wasn't enough, the big round radar station on top makes it easy to spot from all over the place. For weeks it's been tempting us to come on up and take a look. So, today we did. 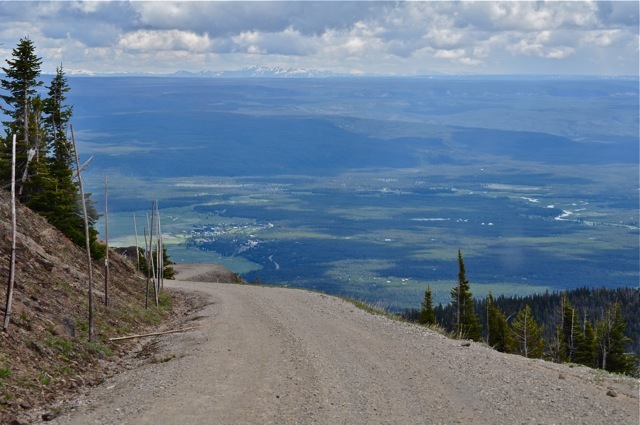 We made the 4,500-feet climb from the valley floor along an 8-mile gravel road. 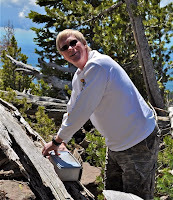 To break up the trip, we decided to search for a couple of geocaches along the way. At the first stop we met a couple of cachers on vacation from Tennessee. 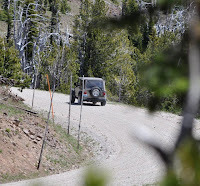 That's them in their Jeep heading up the hill from the first caching spot. Paul made this quick and easy find at about 9,000 feet. Even on this cloudy day, the view from the cache was spectacular. The road, however, became just a bit more scary! 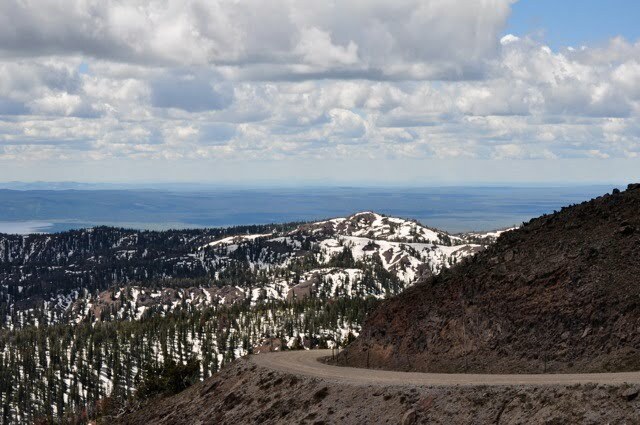 Take a look at one of the hairpins near the top. Rocky loved this! Here's the final turn before reaching the top. No, there are no guardrails anywhere! 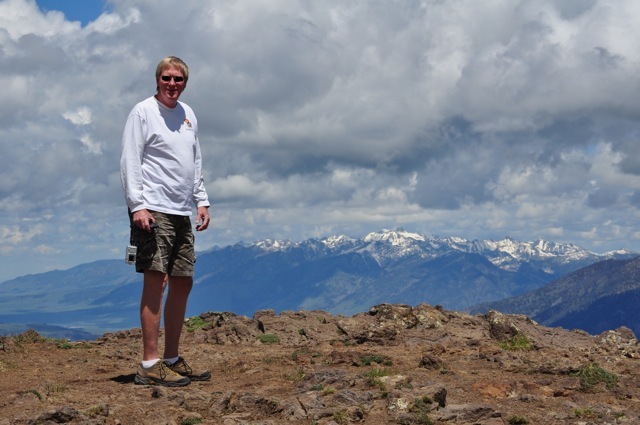 We knew we'd reached the top when we arrived at this imposing structure, an FAA long-range radar dome. We could look, but we could not touch! What a view! This is Sawtelle's neighbor, Mount Jefferson. You can see three states from the top. Paul is posing in front of Montana! Here's a look at our neighborhood from the top. That's Henry's Lake. If you could see through the tree-covered hill in the lower right you'd see Bullwinkle! Yes, Paul, I can see the lake from here just fine, thank you! 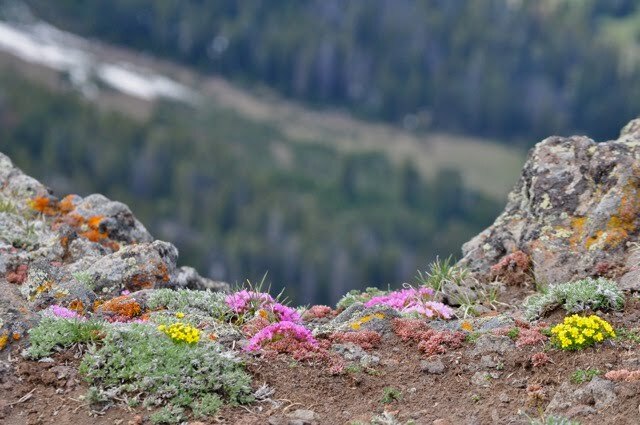 When we weren't gawking at the view of Yellowstone, the Grand Tetons, several area lakes and the green valley below, we enjoyed a very colorful display of low-lying wildflowers at the peak. It's a amazing these little guys can survive up here. 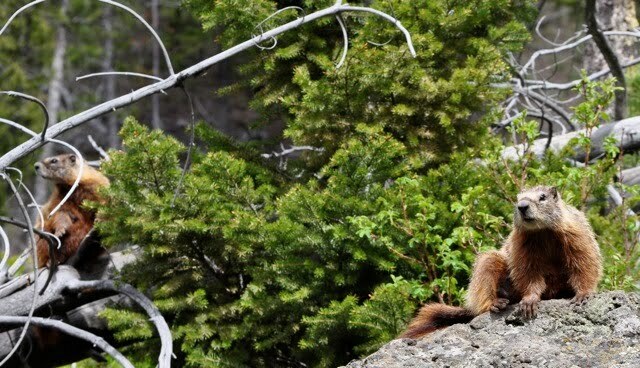 The trip down was uneventful, and we're so pleased to report our trusty squirrel got us off the mountain safely. 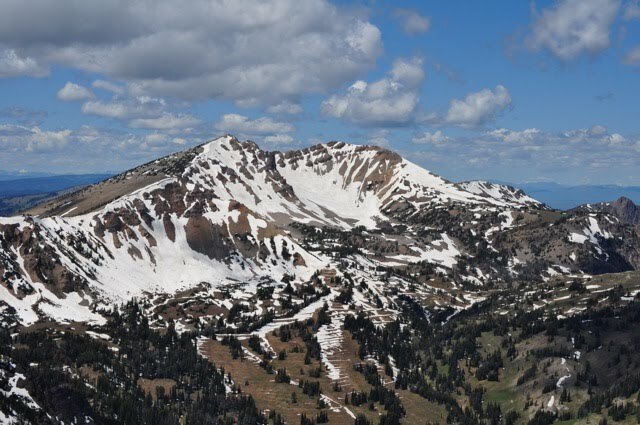 Now, when we look up at Sawtelle Peak we can say "We've been there!" 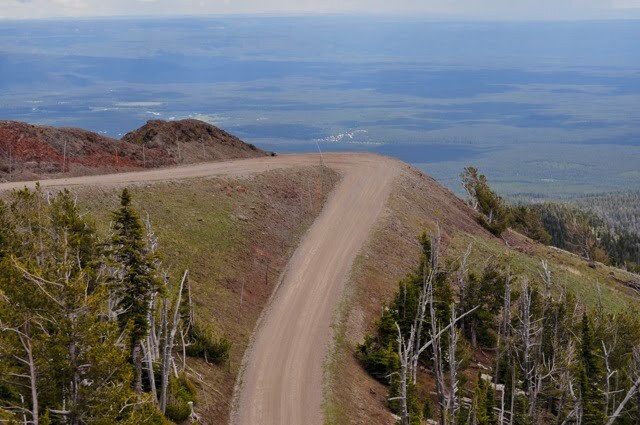 The roadways in Yellowstone National Park are laid out in roughly a figure eight. 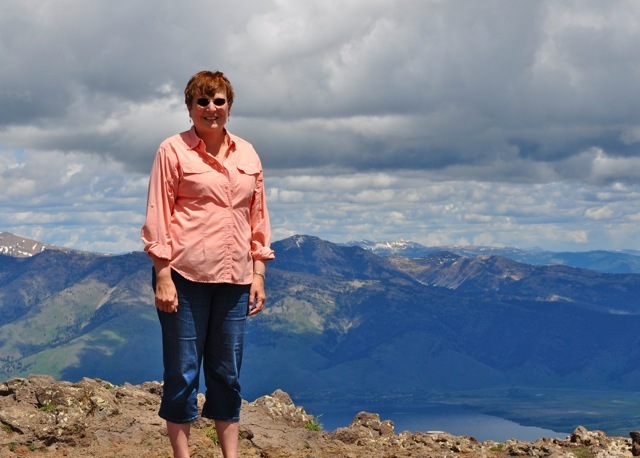 Today we decided to travel the top half of the "eight" and take in the sights of the northern part of the park. 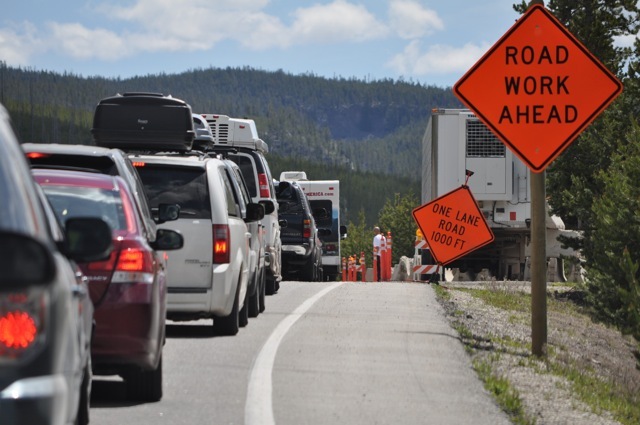 We've noticed a significant increase in car traffic in the park, which makes road construction extra time consuming. Our first stop of the day, if you don't count road construction, was the Artist Paintpots area. 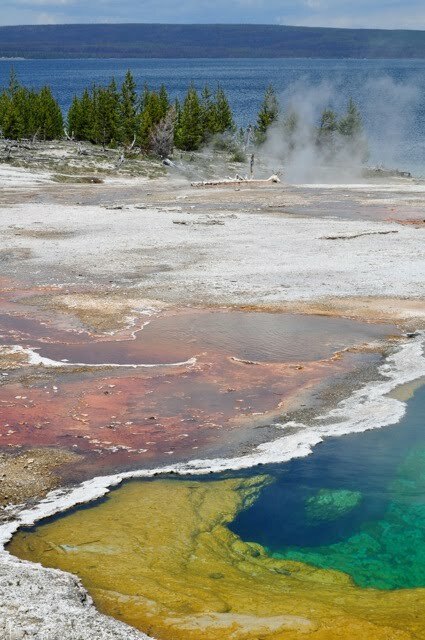 This small thermal area features colorful basins that bubble and dance along a one-mile boardwalk loop. 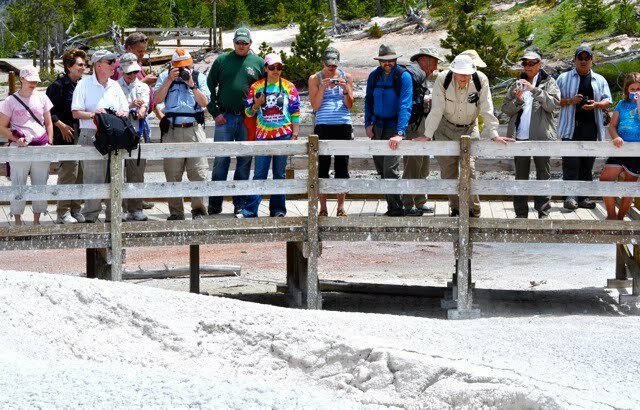 And what are these visitors to the paintpots gawking at? It's a mudpot! 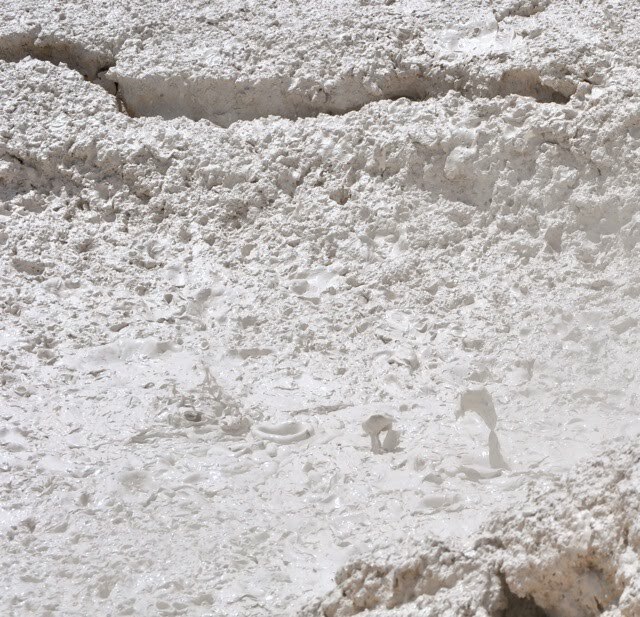 This seething pool of sulfuric acid, silica, clay and dash of water was fun to watch, but not so pleasant to smell. By the looks of the white splatters on the boardwalk, there are days when the mud really flies. Visitors, beware! 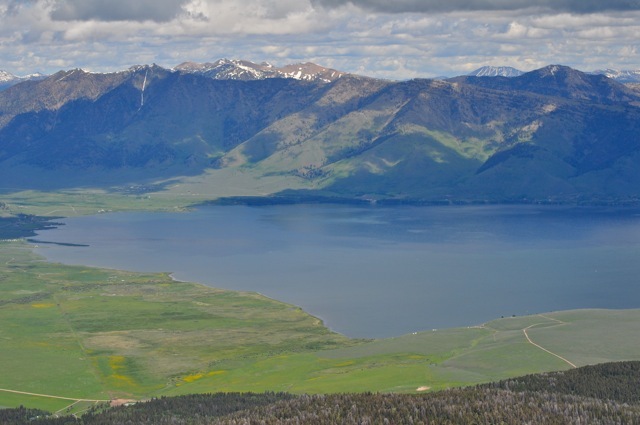 Nearly half a million years ago, the Yellowstone Caldera deposited a flood of hot lava. 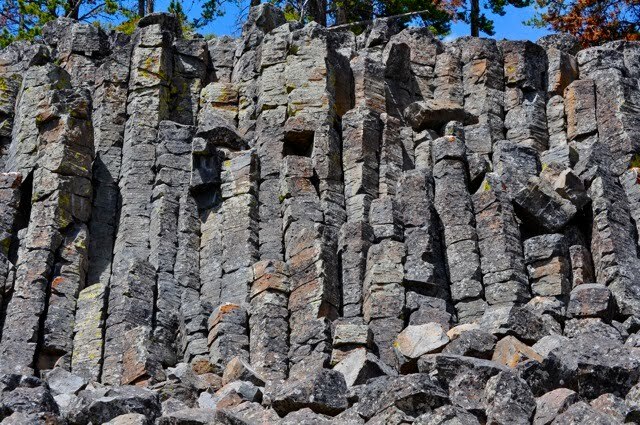 As the lava cooled it formed these columnar joints known as Sheepeater Cliff. Today, it's a great spot to enjoy a picnic lunch. 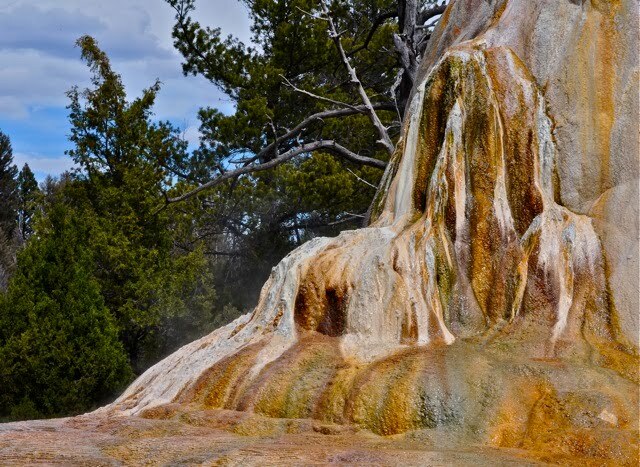 A busy turnout just south of Mammoth Hot Springs offers two noteworthy sights. 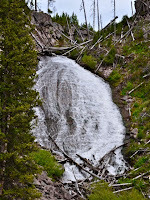 Rustic Falls has a unique and interesting shape as it flows into Golden Gate Canyon. 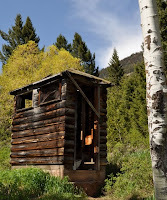 Turn around from Rustic Falls and you see Golden Gate Canyon. The canyon walls take on their golden hue as a result of lichen on the rock. 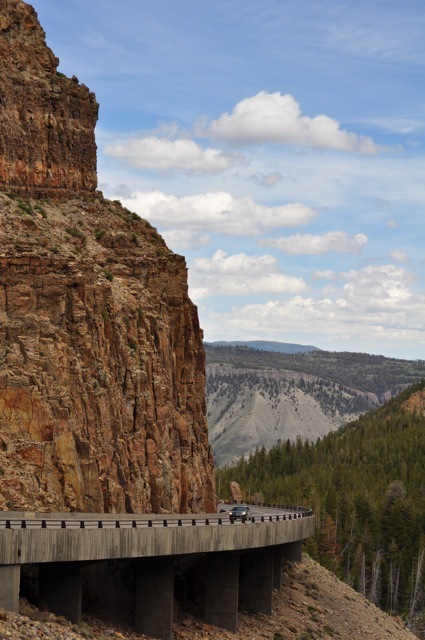 That precarious roadway is Yellowstone's Golden Gate Bridge. Not quite the same as the bridge we knew in San Francisco, but it's impressive, nonetheless. Mammoth Hot Springs was interesting. Mostly, it was very crowded. We took in the views at part of the Upper Terraces. We left the lower portions for another day. 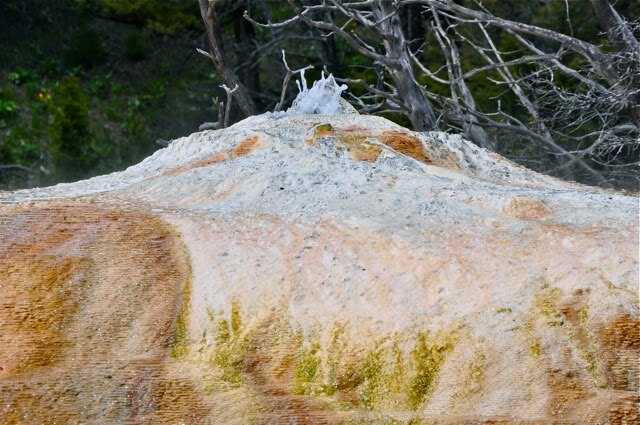 Off the beaten path a bit at Mammoth Hot Springs sits Orange Spring Mound. There are several vents in this monster mound. The mixture of water and bacteria deposits gave this side a shimmering, almost scary look. On the back side of the mound, this happy little vent bubbled away, covering the mound in more shimmering water. 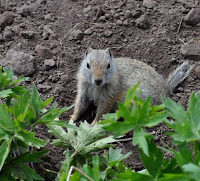 We were treated to several animal sightings on this trip. This is how you know a bear is nearby. It's a mob scene! We did see the bear wandering along the tree line some distance off the road. But, we had to keep our eyes on the stupid bystanders. 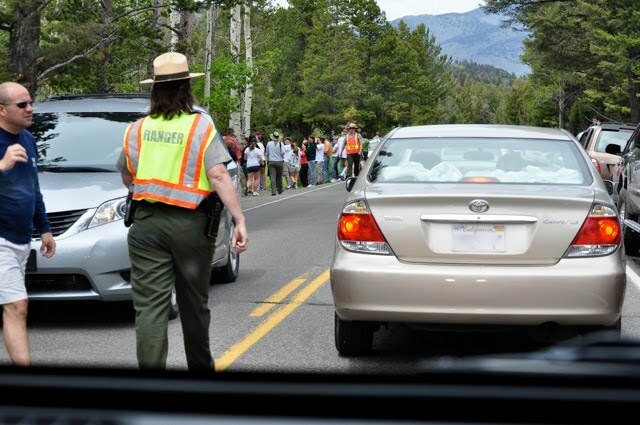 Here, the park ranger was encouraging traffic to keep moving. So, we did. See the guy in the left side of the photo? He walked right out in front of our moving Jeep...with his children! Thankfully, nobody was hurt. And, the ranger gave him a tongue-lashing. 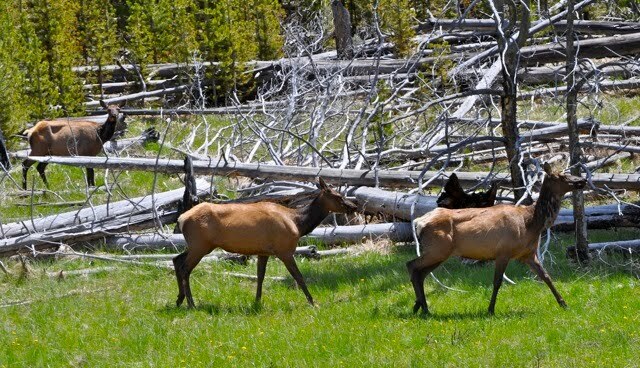 This trio of cow elk caused a minor "animal jam". So, we got a quick "drive by" shot. The highlight of today's critter spotting came on the trail to Wraith Falls. 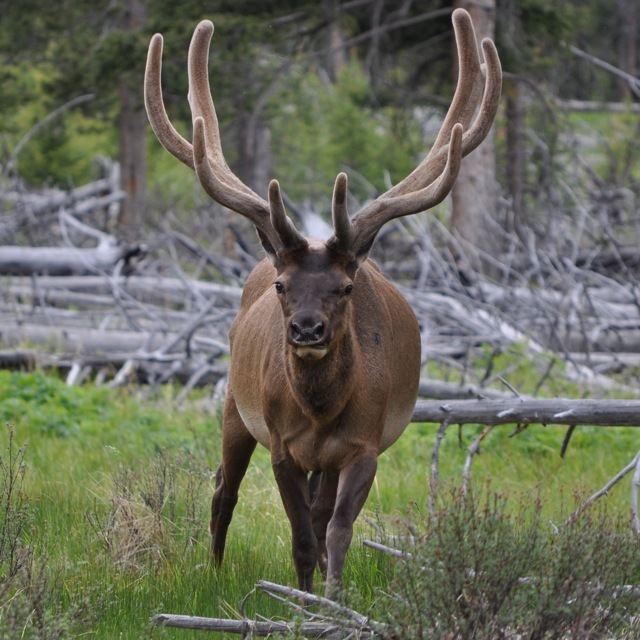 We had to manuever our way through an animal jam caused by a bull elk grazing along the road. It just wasn't worth the fight to get a picture of that guy. 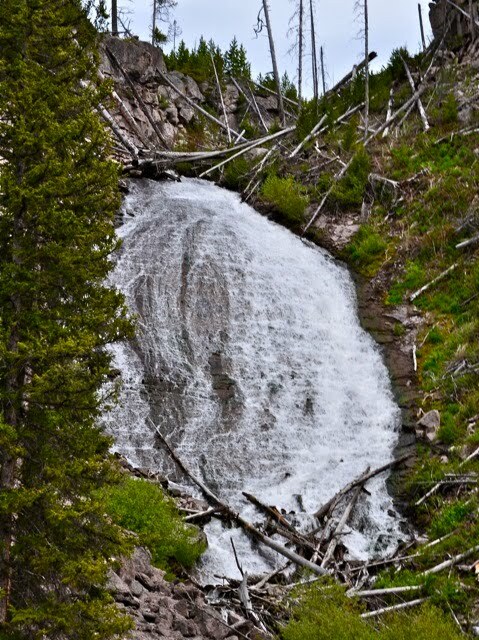 We were ready for a stretch, so we decided to enjoy the one-mile round-trip hike to this 100-foot gently sloping cascade along Lupine Creek. 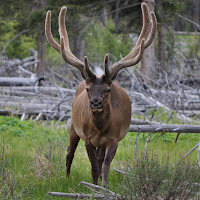 After a minute or so on the trail we were greeted by a bull elk. Isn't he beautiful? 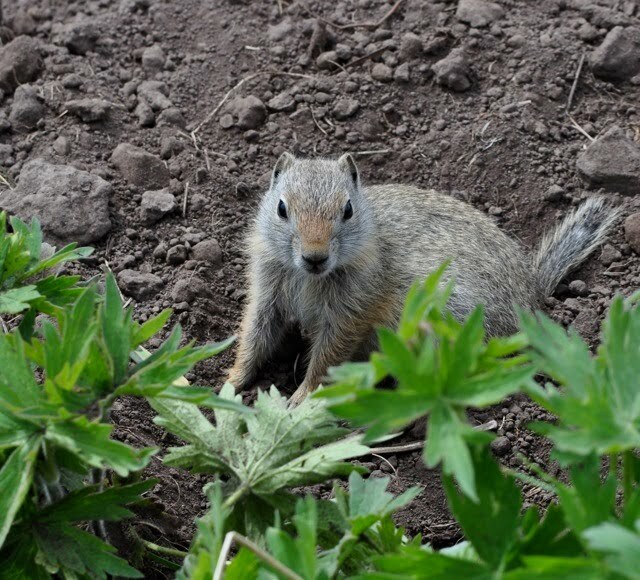 On the opposite end of the size scale, we spotted this little ground squirrel just up the path. 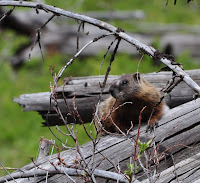 On the way back from the falls, we spotted this pair of marmots on guard in the woods. A few steps later we saw what they were protecting. This is one of several babies with the pack. 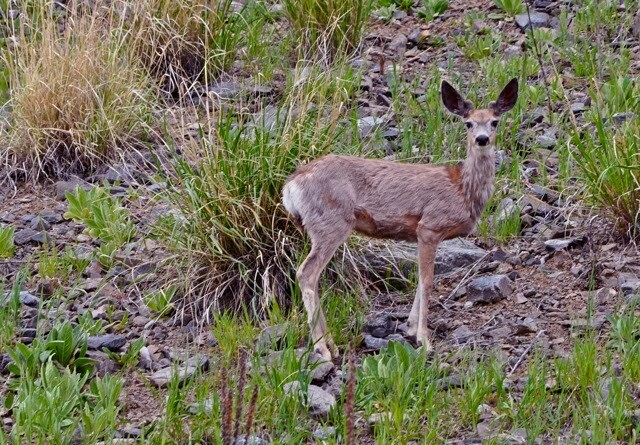 Before we got back to the Jeep we spotted an antelope, too. Unfortunately, he was too far away for a photo. We wrapped up the northern Yellowstone loop with a trip over Dunraven Pass, at 8,859 feet. After that, our trip home was all downhill! Blessed with a break between morning and evening showers, we made a midday trip to the Madison River Canyon Earthquake Area. Along an 11-mile stretch of US Highway 287, we learned the story of what happened along these peaceful shores 50 years ago. 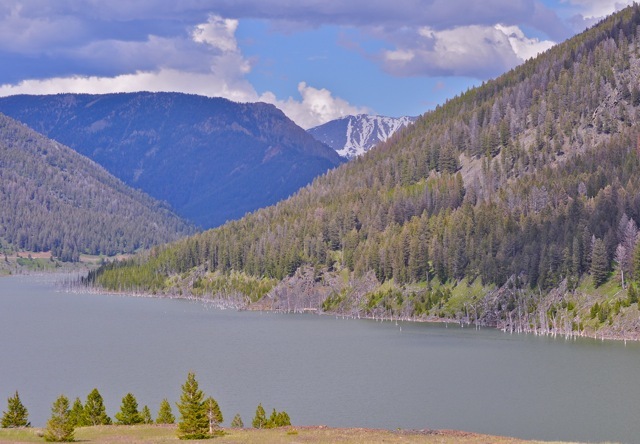 On the evening of August 19, 1959, the area just west of Yellowstone National Park experienced an 7.5 magnitude earthquake. At the time, it was the largest earthquake recorded in the United States. The property damage is still visible today. 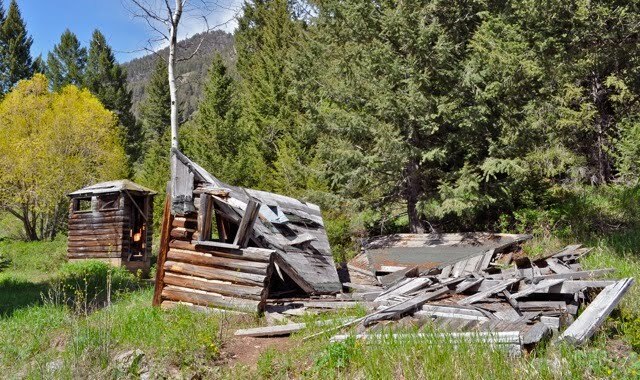 Here are the remains of one of two cabins along Hebgen Lake. 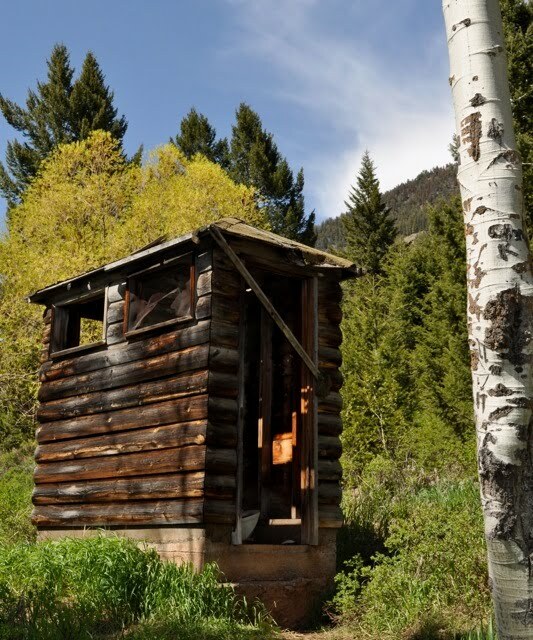 Although all of the surrounding structures were destroyed, this outhouse remained in one piece. A woman in her 70s and her dog were sleeping in this cabin when the quake struck. 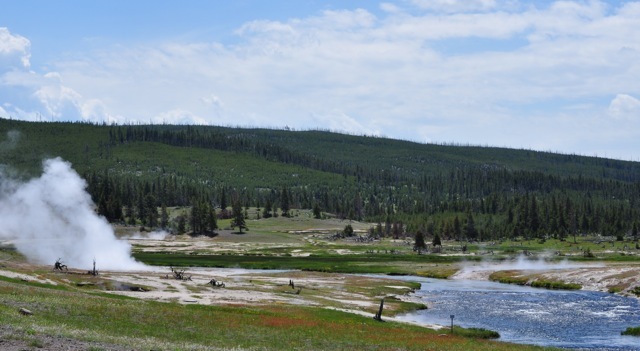 The occupants survived, but the cabin ended up in rapidly rising Hebgen Lake. 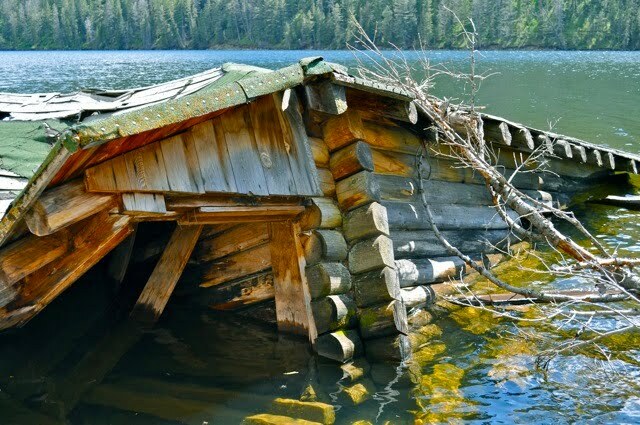 A neighboring cabin is submerged several feet below the surface at this peaceful spot on Hebgen Lake. 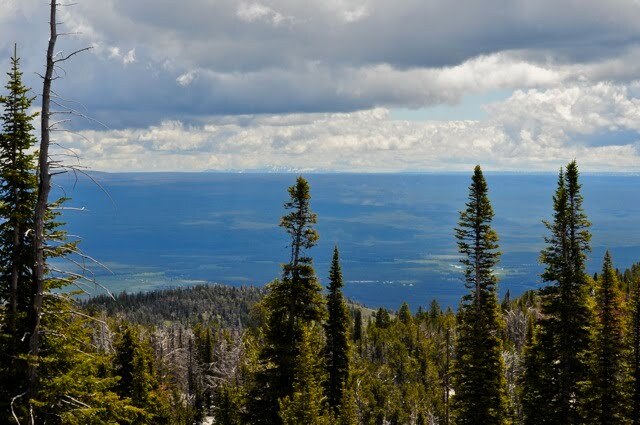 The temblor caused a landslide of some 80 million tons of mountain onto a Forest Service campground below. 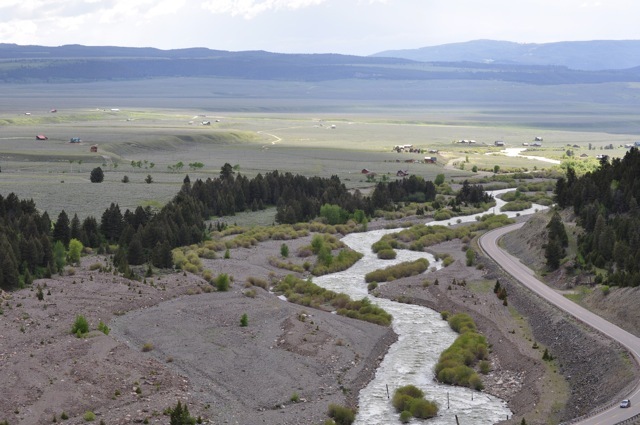 The tumbling rock buried 19 campers alive and dammed the Madison River. 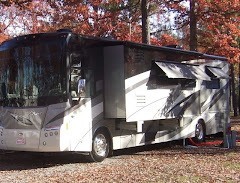 The rapidly rising water killed another nine campers. 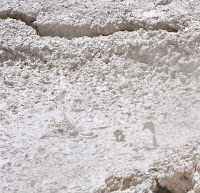 The resulting lake was dubbed Earthquake Lake. 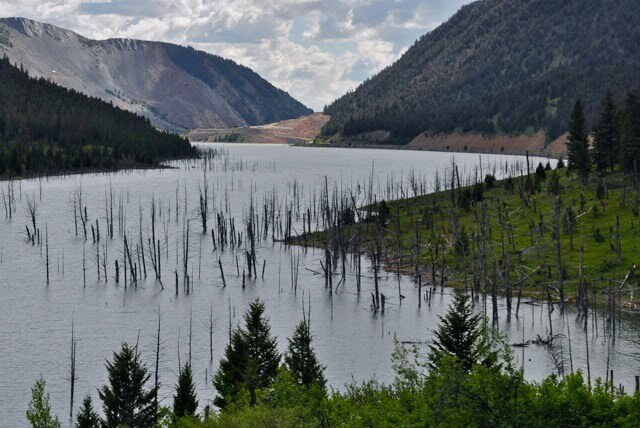 More than 50 years later the evidence of that tragic night can be seen in the immense pile of rock at the far end of the new lake and the skeletal trees poking up on the lake surface. In 1967 the US Forest Service opened a Visitor Center near the landslide. The building serves as an interpretive center about geology and the events of that fateful night and a memorial to its victims. The view from the Visitor Center is stunning, in an eerie sort of way. On the other side of the debris pile, the Madison River and Highway 287 wind gently to the West. 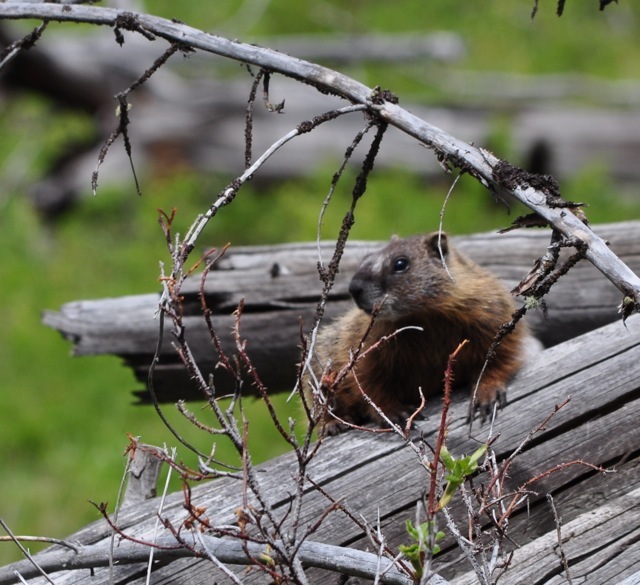 As we emerged from Madison River Canyon, one of its current residents posed for a photo. We enjoyed a scenic drive through the valley back to Red Rock, arriving just in time for the showers to return on this last day of Spring.